Over two dozen alumni -- including a Webster Vienna graduate currently living in the Netherlands -- enjoyed a long afternoon of sunshine as clipper ships cruised the horizon and para-sailing racers bounced over the waves just off shore. 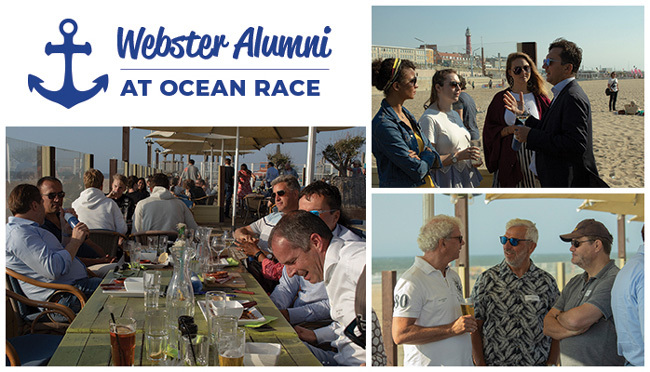 Webster University Leiden alumni from the graduating classes of 2000 to 2018 networked and shared their Webster stories during an alumni event last month at Scheveningen beach in The Hague during the Volvo Ocean Race. The race is a major event in the Netherlands, and served as a perfect opportunity to bring alumni together. Over two dozen alumni -- including a Webster Vienna graduate currently living in the Netherlands -- enjoyed a long afternoon of sunshine as clipper ships cruised the horizon and para-sailing racers bounced over the waves just off shore. The group shared stories about the campus over the last generation at Club Copacabana before heading to the main pavilions. The Dutch are masters of the Volvo Ocean Race, with six sailors on the race course this year and Nederlander Carolijn Brouwer on the winning boat. Webster Leiden alumni also master their own race course, of sorts, but sometimes must explain it to the Dutch. Class of 2016 MBA graduate Sebastian Ruigrok tells it again and again in his work at Siemens Nederland, part of German conglomerate, Siemens AG. “And some people, if they’re Dutch, would say, ‘Isn’t that a private university of some kind?’” Ruigrok explained. And while the Dutch are masters of the sea, Gorloks can rest assured the campus in the Netherlands has mastered an attribute which is key in today’s professional world: diversity.